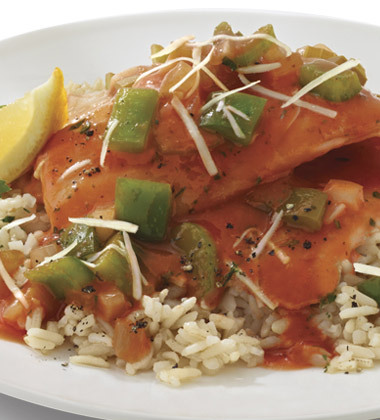 This flavourful and moist fish entree is easy to create using Campbell's® Condensed Reduced Sodium Tomato soup and a few simple ingredients. 1. In bowl mix together oregano, gumbo file, if desired, and peppers. 2. Lightly spray 2 shallow, full-size (12 x 20 x 3 inch) hotel pans with cooking spray. Fold fish filets, tail side under, and arrange in a singled layer in the bottoms of each pan, 12 per pan. Sprinkle tops of fish evenly with 2 Tbsp. oregano-pepper mixture. Reserve remaining herb mixture for sauce. 3. In a large sauce pan, heat oil over medium-high heat; add onion, peppers and celery and sauté until tender, about 5 minutes. 4. Stir in garlic and remaining oregano-pepper mixture and continue to sauté 2 minutes. 5. Mix in Campbell’s Reduced Sodium Tomato soup, water, parsley, lemon juice and zest; bring to a boil. Remove creole sauce from heat. (Sauce may be made ahead, cooled and refrigerated.) 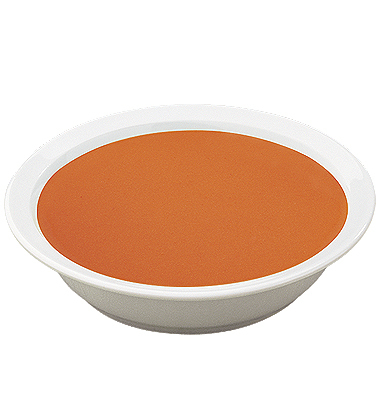 CCP: May be served hot 140°F (60°C) or higher, or chilled 40°F or lower. 7. Bake in 375°F (190°C) conventional or 325°F (160°C) convection oven 30-35 minutes, uncovered until the fish is tender and cooked through and the sauce is bubbly. CCP: Cook to an internal temperature of 140°F (60°C) or higher for 15 seconds. 8. Sprinkle tops of fish evenly with Parmesan. CCP: Hold hot at 140°F (60°C) or higher for service. 9. To Serve: For each serving, portion 1 fish filet on top of a 1/2 cup (125 mL) rice and top with 1/3 cup (80 mL) pan sauce over fish.